Updated September 10, 2018 - Over the last few months, high-profile colleges including Yale, Harvard, and Dartmouth have announced that the SAT/ACT essay will now be optional for applicants to their schools, citing the inability of a single essay to reliably predict a student’s college writing capabilities. As of this posting, only about 15 colleges still require the SAT/ACT essay—but those colleges include popular powerhouses such as all University of California schools. Furthermore, an additional 20+ colleges, including competitive schools like Stanford and Amherst, recommend that applicants submit an SAT/ACT essay score (Stanford "strongly recommends" the essay). Finally, Princeton, in a move recently mimicked by Brown (and likely other colleges soon), has made the SAT/ACT essay optional, but instead requires all applicants to submit a graded writing sample. 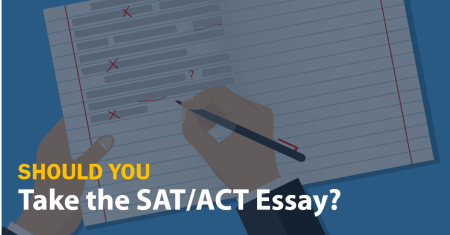 Should YOU plan to take the SAT/ACT essay? Here’s how to decide. It’s important to get this decision right, because if you don’t take the SAT/ACT essay now but then later decide to apply to colleges that require it, you cannot take the SAT/ACT essay section by itself—you would need to retake the entire test. Furthermore, some colleges will elect not to include non-essay SAT/ACT administrations in their “super score” calculation of your tests. As with so many decisions in the testing/college admissions process, choosing whether to take the SAT/ACT essay depends on your college list. -Check out this post for basic guidance on starting your college list. -When you're ready to talk more about your college list, sign up for North to My Future, your free college admissions strategy session. -Finally, when you're ready for professional guidance on finalizing your college list, check out our premium college admissions consulting programs. 3. You have already performed reasonably well (scores of 14+ out of 24 on the SAT or 7+ out of 12 on the ACT)1 on a practice SAT/ACT essay. Why do we say this? If you’re already reasonably proficient (or better) on the SAT/ACT essay, it will be relatively straightforward to improve your score during the SAT/ACT prep you're already planning to do. Our SAT/ACT Prep Class include essay prep at no additional charge (for SAT/ACT Individual Prep programs, you have the option to add one hour of essay instruction), and essay prep requires a minimal time investment. For example, in our ACT Prep Class, we spend about 1.5 hours of class time covering the essay, and over the last 12 months, students who took the essay improved their essay score an average of 1.8 points (on the 2-12 scale). Because improving your essay score is relatively straightforward if you are already proficient in writing, you may as well briefly prepare for and then take the essay to showcase your skills for colleges that fall in the “essay recommend” camp. Need to check your essay skills? Our free practice SAT and ACT tests include an essay score and rubric. -The essay is an opportunity to demonstrate proficiency in writing. It's an easy way to give your admissions profile a boost (albeit a small one), especially if you’re already good at writing, or if you want to showcase your skills in writing to help compensate for lower grades in English classes. -Compared to the rest of the SAT/ACT, preparing for the essay often requires only a small time investment to achieve meaningful improvement (see what we wrote above). -If you take the essay and achieve a reasonable score, you won't have to worry about the essay requirement/recommendation as you finalize your college list. -Taking the essay will require an additional 40-50 minutes of your time on test day, plus, if you prep with Frontier Tutoring, a couple hours of dedicated preparation time. Registering for the official SAT/ACT essay also costs an extra $14 - $17. -It's theoretically possible that you could perform very poorly on the essay on test day. However, assuming you prepare ahead of time, this outcome is unlikely—generally, you should expect to score in the same range as your most recent practice test indicates. Additionally, it has been acknowledged that the essay has dubious predictive validity, so scoring slightly below your target score on the essay is unlikely to be materially harmful for admissions purposes. Ultimately, you have more to gain than you have to lose by preparing for and taking the essay. If there’s a reasonable chance you’ll be applying to colleges that require or recommend the SAT/ACT essay, go ahead and take it. Like most things that have to do with college admissions, that means the starting point for this decision is developing a preliminary college list—it’s as simple and as complicated as that. The good news is that we have plenty of resources to help you on your journey. Below is a summary of the resources we have discussed in this post to get you started. As always, please feel free to contact us with questions about your individual situation. 1These are the approximate national average scores for the SAT/ACT essay sections. Source: CollegeBoard and ACT, Inc. 2017 National Reports. While it is not straightforward to determine median essay scores for admitted students (in contrast to determining median overall SAT/ACT scores for admitted students), certain schools (such as the University of California system) do make this information public. We don't recommend investing significant time in calculating an exact target score for the essay itself; the more meaningful decision is whether or not to take it, and if you are taking it, then preparing sufficiently to achieve a respectable score.